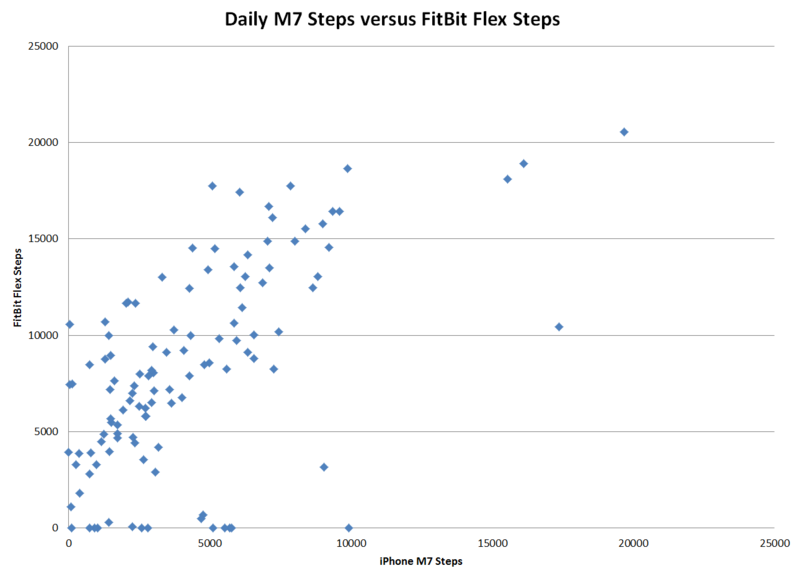 I’ve had an iPhone 5s since late September 2013, and wanted to examine the relationship between the daily step data it records and the daily step data my FitBit Flex records. Of course, the data from the M7 should consistently underestimate my step count, since I’m always wearing my Flex but don’t always carry my phone with me (especially when I’m working out). 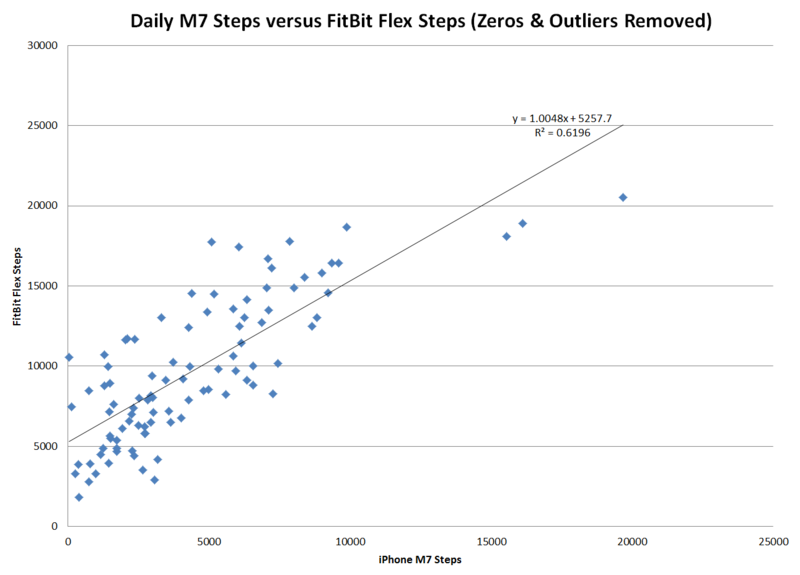 This post is thus fundamentally different from previous posts, because the underlying variable is really about my personal phone-carrying habits (I’ve already done a brief experiment which incorporates a step-for-step comparison of the M7 and the Flex). Nevertheless, I wanted to see how accurate the M7 data would be in predicting my daily FitBit step count. There are several incredible features on this plot. The first is that the Y intercept of the linear regression (5257.7 Steps) is very close to the number of steps that my typical cardio workout routine (30 min on the elliptical) generates. I haven’t gathered data to support this, but I know qualitatively that I can always expect to gain about 5,000 steps on my FitBit after a 30 min workout. The M7, by contrast, gains no steps during this time as it is just sitting on the display stand streaming terrible Jason Statham movies off NetFlix. While this is seemingly a good explanation for the Y intercept, it is weakened by the fact that 1) I certainly don’t do cardio every day and 2) there must be an inherent baseline of daily of steps that my FitBit sees which my phone does not (for instance, getting dressed in the morning, showering, etc). It would be interesting, particularly for Apple or an app maker utilizing M7 data, to see what the average American’s baseline steps without their phone are, not including working out. This number could then be added back into M7 based step measurements in order to give a more accurate picture of a users real step count. 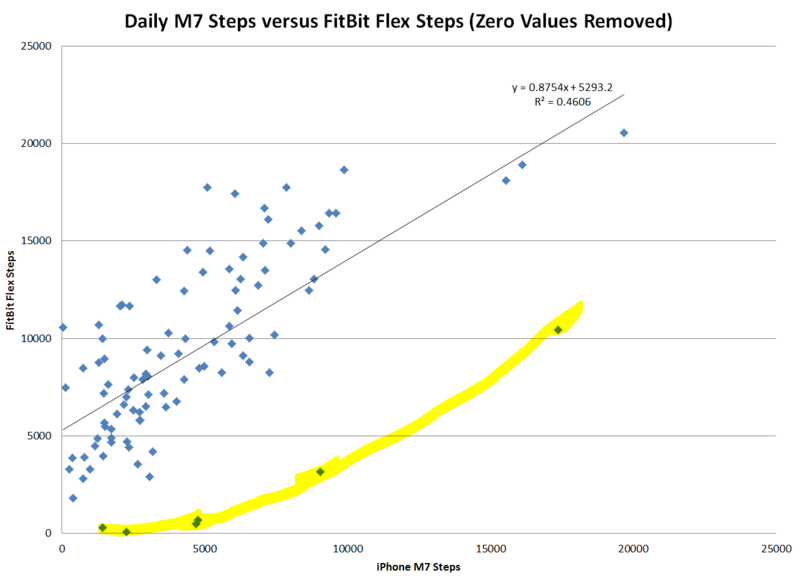 The second notable feature is that the slope of the line is almost exactly 1, which means that aside from any baseline + elliptical generated steps, the FitBit and M7 are almost spot on in their step counts. If the slope were considerably greater than or less than 1, it would be evidence that there is a systematic bias between the two measurements. Finally, the R^2 value is decently high, which means that M7 data could probably be used to give me a rough idea of my FitBit step count on average. While it’s unlikely to be good enough to make determinations on a daily basis, if I can keep my phone on me for most of the day, I could probably bucket my weeks into high, med or low movement without having to keep track of going to the gym.